Norwegian indie studio Rain Games has revealed that its forthcoming 2D puzzle platformer Teslagrad is headed to the Wii U eShop. The Nintendo version of the game will launch alongside the other editions later this year. Set in a steampunk world governed by electromagnetic forces, Teslagrad places you in the shoes of a young boy who is attempting to overthrow an evil ruler. You must work your way through the Tesla Tower, gaining new powers and interacting with over 100 different rooms. The full press release is below, and you can check out the two trailers further down the page. This game looks absolutely stunning, and we have to admit we've very excited about playing it later this year. We at Rain Games are proud to announce that our puzzle sidescroller game Teslagrad is now heading to the Wii U. This new version for our highly anticipated videogame joins the already announced releases, which will be available this fall (Q4 2013) ; PC Windows, Mac OS X, Linux, and Playstation®3. Teslagrad will arrive to Nintendo's eShop simultaneously with the other scheduled versions. 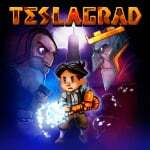 Teslagrad is a puzzle platformer with action elements, where magnetism and other electromagnetic powers are the key to the world's challenges. Discover the secrets kept in the long abandoned Tesla Tower. Gain new abilities to explore a non-linear world with more than 100 beautiful hand-drawn environments, in a steampunk-inspired vision of old Europe. You play as a young boy who suddenly finds himself embroiled in a long-forgotten conspiracy, involving the despotic king who has ruled the nation with an iron fist for several years. Jump into an outstanding adventure told through voiceless storytelling. Armed with ancient Teslamancer technology and your own ingenuity and creativity, your path lies through the decrepit Tesla Tower and beyond. Complex puzzles! Put your sense of logic to the test and cleverly manipulate the world around you using electricity and magnetism, the lifeblood of the game. Puzzles will range from pff, that wasn't so bad to keyboard-smashing, controller-chewing frustration. Explore! Make your way through rich 2D hand-drawn surroundings as you journey into  and beyond Tesla Tower, as you discover and use amazing new items. I would definitely check this out if I ever get around to buying a WiiU. Nice! These guys are from my home town Bergen! I met them! They're cool! I had never heard of this game until now, but now it is definitely on my radar! Wow great looking indie game. Keep them coming Nintendo. Sounds great. Visually told story, challenging puzzles built around a few means of manipulation, and no disruptions all remind me of Toki Tori 2, which is my favorite Wii U eShop game right now. Looks sweet, I'll keep this one in mind! I have to keep my eyes on this. I feel the urge to get this game. He has a companion cube. Looks really fun. What a cute concept! I love the name Teslagrad haha. I will have to consider this game. I have never heard of this game, but I'm definitely interested. The game looks gorgeous! I've like games that have beautiful animation like this and good old-fashioned side scrollers never get old. This looks pretty cool! It seems that there have been tons of "retro-styled" games coming out from indie developers, so I think it's nice to see a new style and gameplay concepts. It reminds me a bit of A Boy and His Blob! @Mortenb Bergen, Norway? I stayed overnight there once while traveling through Scandinanvia. Lovely town! Fond memories of eating waffles with cheese. And in other news, yes, this looks nice. Not sure what the companion cube is doing in the second video, but I hope this continues a trend of strong indie presence on Wii U into this holiday. @LittleIrves Yes, that's correct! I noticed the companion cube myself. Weird. Looks interesting. Reminds me a bit of La Mulana, which was awesome. I think I'll have to get this! Looks great. I love the animation style. Let's hope the gameplay is good too. Looks pretty slick, so I'll definitely check it out! For announcing a same-day release as other platforms, plus a great looking game, I really hope this sells well on WiiU. Woah. I'll definitely keep an eye on this one. I may need to keep an eye on this.